© Malcolm Pym & Stuart Smith. Our group arrived at Plymouth off varying trains, where we met our host from Network Rail (Craig Munday, Mobile Operations Manager) on platform four. After formalities and a short briefing we were escorted through the security access gate on the former parcels platform and into the grey brick building which houses Plymouth Panel Signal Box, as well as rooms which serve for the MOM’s and P-Way staff working in the area. One of our group (Brian Holyland, a former Signaller at Greenford East) was instantly recognised by a former colleague from the London area. We moved through to the operating floor of the box, which overlooks the west-end of Plymouth station. 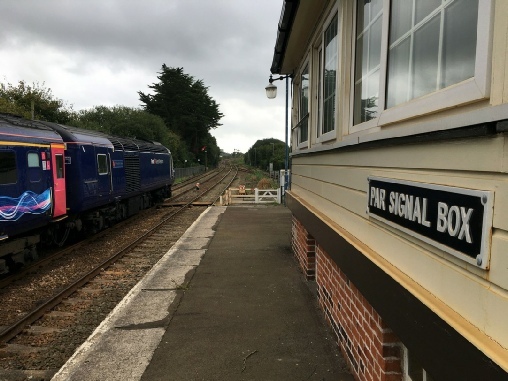 The overall area covered by the panel extends from Totnes in the east to Menheniot in the west, with the neighbouring signal boxes being at Exeter and Liskeard. 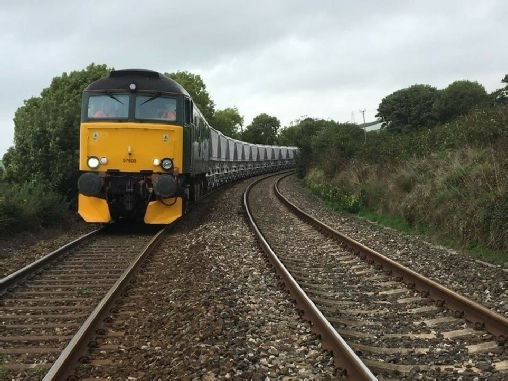 Plymouth also has responsibility for the lines to and from Laira Traction Depot (and its triangle facility), access to the Gunnislake branch, the P-Way yard at Tavistock Jct, plus the little-used connections into Ernesettle MOD & Devonport Dockyard. The current panel box dates from 1960, and upon its opening replaced four mechanical boxes in the station vicinity: North Road East, North Road West, Mutley & Mannamead. Over the next few years (until 1973), the former boxes at Laira Jct, Keyham, Saltash and St Germans were also closed and incorporated into the Plymouth operation. From 1973 through to today, the area controlled remains the same. The two signallers on duty (Jerry Gould and Andy Greening) gave us a detailed explanation into the workings of the area and the signalling systems used. The numerous line blockages being requested and taken by P-Way (via telephone) kept the operators busy between the regular train movements. Our visit lasted just short of an hour, where we headed back to the station, before boarding a GWR Class 150 (150246) for the hour-long ride, in a fairly crowded train, to Par. We had agreed to meet Craig here at 14:00 (he had driven by road, as he was officially on duty), so this gave us time to take lunch in a nearby eatery before continuing our visit. We arrived back at the station just as an HST was arriving from London (about 10mins late), and also witnessed the departure of the local branch service to Newquay, which was held for a few minutes to allow for connecting passengers to transfer between services. Just as our visit was due to start, a DB-Schenker ‘China Clay’ service arrived, and stopped briefly for a crew change. This was 6P24, 15:25 Parkandillack to Fowey Dock, formed of a Class 66 (66031) and 38 CDA wagons, running somewhat early! Craig invited us into the signalbox where met the duty signaller, who explained the workings of the various levers and instruments. The sound of the bells and block equipment was like stepping back in time! The box here is original and dates from 1879, although it was enlarged in 1913 to house 57 levers, which it retains to this day. A small panel section has been added to control the colour-light section from St Austell through to Probus. 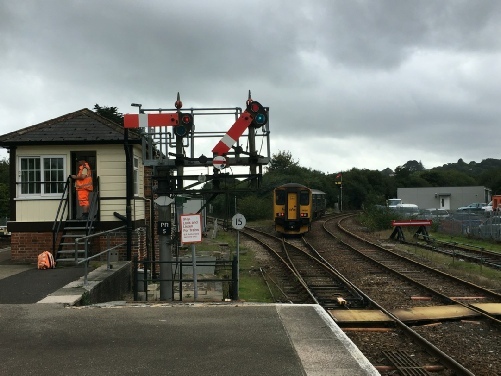 Neighbouring signal boxes are at Lostwithiel, Truro and St Blazey (on the Newquay branch). Before too long, the expert eyes of both the signaller (and Craig) were noticing that the freight we had seen earlier had still not cleared the section, despite having had a clear run. There fears were confirmed when a GSM-R call came through from the driver to say that he had slipped to a stand with his train of over 1750 tonnes and that he was manually sanding the rails, as the automatic sanders on the loco appeared not to be working effectively. Several phone calls to neighbouring boxes followed without pause (to get subsequent trains held back) and also to GWR at Long Rock asking for a possible use of the ‘Night Riveria’ Class 57/6 as a rescue locomotive. [For the record, the nearest DB loco was at Westbury]. 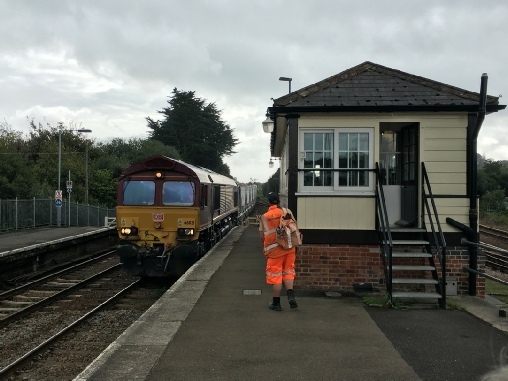 It was pleasing to see a high level of professionalism by those involved and how the various companies; Network Rail, DB Schenker & GWR all seemed to work together locally. We boarded the 15:06 service to London Paddington (formed of 2x 5-Car IET sets (802005 & 802008) and awaited developments. We eventually left Par at 16:27 (81 mins late) and travelled wrong line to Lostwithiel under SLW conditions with a pilotman. We passed the stricken freight train still some way short of the summit at Treverin Tunnel. The arrival into London was at 20:24 (just over an hour late), helped by an alteration to calling points, which made the service from Plymouth; for Exeter, Reading and Paddington only. From Reading to London the IET’s operate in electric mode, and the difference in speed of acceleration was clearly noticeable between this and diesel-mode when running up from Par. 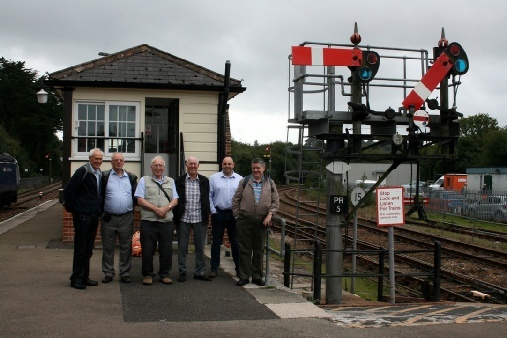 All in all, the visit had been a great success, and allowed members to see the vast differences in signalling practices between the two locations. My thanks go to Craig Munday for arranging the visit, and to the staff we met on the day. * As a footnote, 57605 ‘Totnes Castle’ did get sent from Long Rock Depot at Penzance to assist the failed train. The loco was used to drag the freight train back to Par and into the freight yard at St Blazey. The GWR engine then returned to Penzance to be in position to work its booked overnight train at 21:45.